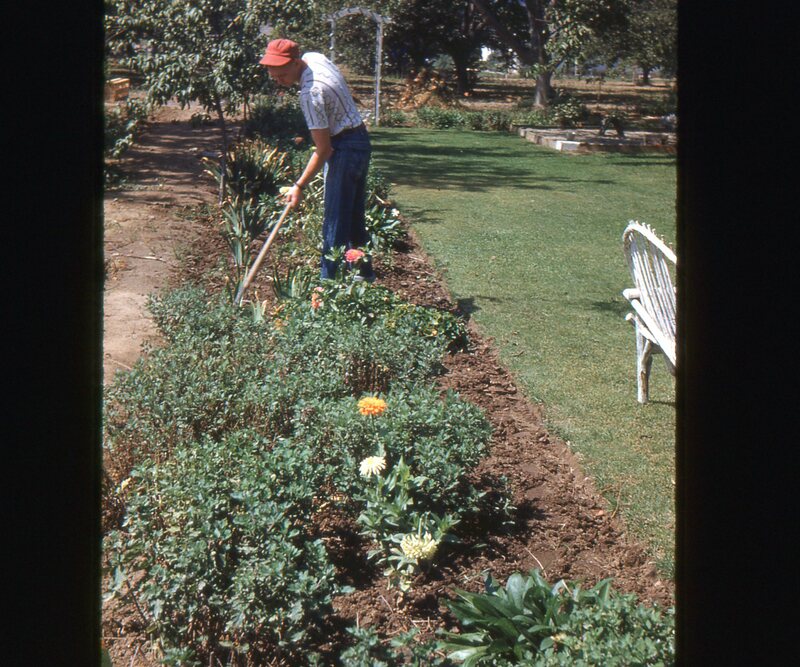 The author tending his farm, 1951. Bill was a teamster when teamsters still drove horses. Six feet four inches tall, nearly 300 pounds, hands like grappling hooks, and an unusually small head atop his great body, he was a gentle giant. In Idaho’s early days he worked building roads in and around our hometown, hauling dirt and gravel, running a one-horse slip scraper and sometimes a Fresno scraper, the forerunners of bulldozers and skip loaders. How he became a close friend of my father I never knew. He was always just there. In the early 1900s my father and mother came west and settled in Idaho, where dad was a federal marshal, a deputy sheriff, and the first chief of police in my hometown. He farmed, too, in those early days, and in 1930 we moved from town to a farm and he began farming full time on two 40-acre pieces of land, and renting another 80 acres that lay across the road from the home place. Somewhere in his many civic and farming activities, he and Bill became friends, and I saw Bill often as a child and a young man, when he worked for my father from time to time on the farm. Bill had a wife at one time, but she was long gone when I knew him, and he lived alone in a small house on the outskirts of town near the Snake River. He kept his magnificent teams of horses there, huge animals as he was huge, but gentle and quiet, shoulders and haunches heavy with muscles, horses that could pull almost anything, unlike some of the scrubs my father had picked up over the years. While Bill may not always have been wearing the cleanest blue shirt and bib overalls, his horses were always groomed to the last detail. They were curried and brushed until they shone, their manes neatly trimmed and the tails often clubbed. Even if the horses didn’t impress a young boy, the harness did. The silver knobs atop the hames were polished to a high luster, and the flat straps of the harness, crupper, and traces wore shiny spots that glittered in the sunlight. Bill was past middle age when I knew him, and he commanded great respect among the itinerant, depression farm workers, as well as the farmers around the countryside. I never heard him raise his voice except to urge a team of horses on, and he was as good as two men on a haying or threshing crew. I saw him at farms other than ours, since he worked out for several farmers, and as I grew older and began to do almost a man’s work, I’d see him here and there as we traded work with others. Many of the lesser mortals would work a little harder just to keep up with Bill, or out of his way. He wasn’t a conversationalist. Once when Mother was feeding a haying crew and he was living on the farm with us while he worked for my father, I remember her asking him at breakfast how he liked his eggs done. “Anyways, jest so they’s fried,” was his laconic response. When I was younger, ten or eleven, I don’t ever recall Bill saying much of anything to me. He was a man’s man, and kids were tolerated, but that was about all. My first real conversation with him, as I remember, came when I was about 15. I had dislocated and broken my right arm in sports in high school, and the joint stayed stiff and unresponsive. Just beginning to be of some use on the farm, I couldn’t milk cows, pitch hay, drive horses, and I couldn’t shoulder a shovel and irrigate. Bill suggested a remedy. I certainly knew what angle worms were, which is what we called earthworms, but angle worm “oil” was beyond me. “You gather up a bunch of angle worms, squeeze the oil out of them and use it,” he said. I never tried it and my parents didn’t seem to think it was the answer either, but for all I know it may have been a medical miracle waiting to be discovered. When I was sixteen my older brother, who lived and worked in Salt Lake City, died from pneumonia following surgery. My younger brother and I were too young to take in the full impact of the loss. While he and I looked up to our sibling as a man of the world, we were perturbed by the way his death affected Dad. Mother was a strong, quiet woman, taking the death in stride and going on with life, but Dad was disconsolate and depressed for months. He stopped reading the paper, didn’t want us to play the radio, and he seemed to lose interest in life. Bill put it all in focus one day as he and I worked together pitching bundles of wheat onto the bundle wagon. As I grew older, and had boys of my own, I often thought of that and wondered if Bill had ever had children, or a “first boy.” I never knew. Eventually high school was over for me and college meant the University of Idaho, Southern Branch, in Pocatello, now Idaho State University. Moscow, Idaho, in the northern part of the state had the university, but none of my family had gone there. My older sister and the brother that died had gone to the University of California in Berkeley. She graduated from there, but he wasn’t happy there and left after the first year and attended a business college in Salt Lake City. By 1939 the Great Depression was ending, things were better on the farm, and it was a big thing for me to leave family, loved ones and friends and go to the big city of Pocatello. There, trains thundered through the town day and night, there were several theaters, many paved streets, all with names, traffic lights at intersections and many restaurants and stores. And girls, one in particular, who caught my fancy and has stayed at my side for over 50 years. So, I didn’t see Bill for two or three years. But one summer, when I was home from college, Dad and I drove into town to get some repair parts for machinery. He went to the bank first, next door to the Rose Pool Hall. There were always a few loungers around the bank and the pool hall and I spotted Bill among them. In my new status as an adult I had no reservations about going up to him, shaking hands and saying hello. He seemed smaller, older, and not the man I remembered. We talked for a few minutes while I waited for Dad. “What you goin’ to do with all that education?” he asked. I answered that some day I hoped to work on a newspaper and be a writer. He pondered that for a moment. “Just don’t fergit how to plow,” was his response. As we drove back to the farm I asked Dad why Bill was hanging around there in front of the bank in the middle of a working day. I knew that. My father now had a tractor, a bright red Farmall F-14, with rubber tires, and the only horses he had were a couple used for riding. I felt sad to think of that great, gentle, man left stranded by progress. So I went on through college and never worked for a newspaper in Idaho. Instead I worked in Pocatello for a while, then in 1942 with many others, went into the military, served overseas and left Idaho for good. I never saw Bill again, but I remember well when he died. My wife and I were living in California and my mother wrote that Bill had died, had the last rites of the church, and had been buried after a funeral Mass, though to the best of my knowledge he had never been next or near the church in my lifetime. Mother said that everyone in town who could, went to the funeral. There were bankers, doctors, lawyers, farmers, storekeepers, the mayor, housewives, and some loungers from in front of the Rose Pool Hall. He had been a friend to all of them. I asked my father many months later, when we took the kids up to Idaho to visit their grandparents, what Bill had died of. It might be just what Bill would have said. Gerald Burke is a freelance writer of fiction, non-fiction, horticulture and travel . He has been published in Westways, Trailer Life, Country Discoveries, Your Home, Horticulture, SoCal Senior Life, Plus Magazine, Inland Empire Magazine, LA Times, LA Daily News, San Jose Mercury News, Toronto Sun, Christian Science Monitor, San Diego Union Tribune and other periodicals and newspapers.